Since launching in 2007, FreethoughtAction has engaged in several projects. Here are some of them…. Our first billboard, “Don’t Believe in God? You Are Not Alone” launched in January, 2008 on the New Jersey Turnpike outside NYC. Over the next year, we worked with local and national groups to put up more billboards across the country. More about the campaign and the resulting media coverage we received during our first year can be found HERE. A little over a year after we put up our first billboard, FreethoughtAction helped found the United Coalition of Reason (UnitedCoR) with the American Humanist Association, and we worked with them to spread the campaign farther and wider over the next several years. There are now over 80 UnitedCoR “coalitions of reason” which have launched with billboards and bus ads across the country. Once UnitedCoR had taken our ball to run with it with our “Don’t Believe in God? You Are Not Alone” ad, we decided to consider our first campaign a success and focus on a new campaign. We helped found a coalition of local secular, humanist, freethinking, and skeptical groups throughout NC, called the North Carolina Secular Association (NCSA), and launched six billboards in six cities all across the state of North Carolina on June 21, 2010 for 4 weeks — from the mountains to the sea — in Asheville, Winston-Salem, Greensboro, Charlotte, Raleigh, and Wilmington. This campaign was intended as a consciousness-raising effort to point out how every U.S. citizen who doesn’t believe in a monotheistic god is being “officially” marginalized, disrespected, and discriminated against by the insertion of “under God” in the Pledge, by the supplanting of our former de facto national motto–E Pluribus Unum (Out of Many, One)–with “In God We Trust,” by language in certain state constitutions (like the one in NC) which restricts anyone that doesn’t believe in a monotheistic god from holding public office, and in many other ways. We received several rounds of local, national and international media attention, and many of the groups involved had a big influx of new members. More about the campaign and the resulting media coverage can be found HERE. The North Carolina Secular Association that was formed around this campaign evolved into the Carolinas Secular Association (CSA) to include both NC and SC (and beyond) and has held annual conferences since 2011. All-in-all, we considered our second billboard campaign a smashing success! 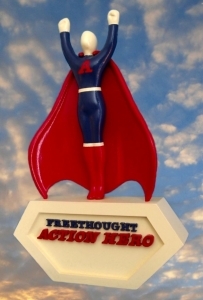 FreethoughtAction has been presenting these awards to freethinkers who improve the image and acceptance of other freethinkers through their good works, and to those who exhibit exceptional courage to stand up and be counted to help bring about a more secular and rational America. More about the award winners HERE. In 2013, we worked with UnitedCoR to build the Secular Directory. The Secular Directory is a resource for freethinkers and secular individuals to locate local groups in their area to join. It also provides information about organizations ranging from local to national to international. And they include groups that, by their activities, can be defined as charitable, congregational, educational, philosophical, political, social, student, support, or more than one of these. You can also find links to a variety of online and print media and videos. Moreover, there are online celebrant services (for non-theistic weddings and funerals), educational resources, and social networks. Finally there are listings for state, regional, national, and international conferences and conventions. You are welcome to take advantage of all these resources. All-in-all, we’ve been very busy since 2007.